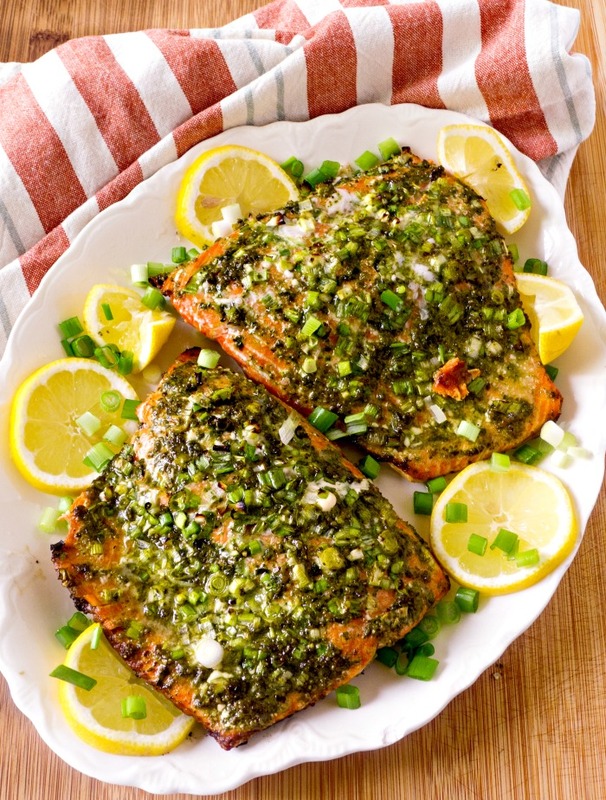 Grilled Italian Pesto Salmon is such an easy recipe we almost didn’t post it. The recipe takes a few ingredients, and it’s on the table in 30 minutes. The salmon is a beautiful pink color with flaky meat and a delicious buttery taste. All you need are five ingredients and half an hour to impress your family or guests with your pesto salmon. You plan on making Grilled Italian Pesto Salmon, and now you’re at the grocery store trying to figure out what kind of fish to buy. The wild caught fish is almost double the price of the farm-raised variety. It’s quite a dilemma, especially since you’re trying to stay within your food. You’re not the only one who’s confused. Some experts say there really isn’t much difference between the two, while other authorities say that the wild caught is superior. Overall, I found, that there are more proponents for wild caught than farm raised. Wild salmon obtain their pink hue from their natural environment by feasting on a diet of krill, which eats red algae. Farm-raised salmon gets its color from food additives. One of the most common dyes used in fish feed is called canthaxanthin. This compound may cause eye defects and retinal damage. Other issues that cause concern are the toxins and contaminants. They are higher in farm salmon than in wild salmon. The antibiotics used in the farm-raised fish stay there and enter your system. There is also the environmental impact the industrial farms have on the surrounding waterways. All in all, we prefer wild caught for our pesto salmon, but the decision is yours, of course. 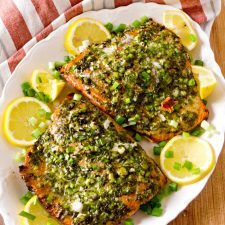 Once you purchase the salmon fillet with skin on the one side, the only other ingredients you’ll need is prepared pesto, green onions, fresh lemon juice, and garlic cloves. I’ll be willing to bet that a lot of you have those ingredients in your kitchen right now. One important step before grilling the salmon is to feel the flesh for bones. The bones are easy to pull out with heavy duty tweezers or pliers. We have a special pair of needle nose pliers we keep in the kitchen just for this purpose. Put the salmon on the medium heated grill (350F), skin side down. Grill for about 5 minutes, then spoon a little of the pesto mixture over the fish. Grill with the lid down about 15 minutes longer or until the fish flakes easily with a fork. Baste the salmon occasionally with the remaining pesto sauce. In 30 minutes you have a delicious and nutritious protein that is low in calories, high in vitamins, and a family that thinks you’re a genius for creating such a wonderful dish. This is a recipe that even non-fish lovers will enjoy. I learned to use pesto with fish, such as our grilled mahi mahi, from my mamma. It is such an easy way to add flavor. We hope you’ll sign up for our weekly newsletter so we can share what we’re doing in and out of our kitchen. If you enjoy seafood recipes check these recipes out. We have so many delicious seafood recipes, we hope you take a look and give them a try. The following are affiliate links. We are a participant in the Amazon Services LLC Associates Program, an affiliate advertising program designed to provide a means for us to earn fees by linking to Amazon.com and affiliate sites. We keep needle nose pliers just like these in our kitchen drawer. I use them to remove small bones in fish or chicken. They are super handy for anything for everything food related. They are inexpensive and certainly saves lots of time. Adding a bit of pesto sauce to salmon or any grilled fish really dresses up the dish. I learned this from my mamma who loved to grill her fish and make this pesto sauce. It can’t get any easier and the end result is better than restaurant quality dish. Try it and see if you don’t agree. A quick recipe that yields a buttery, flaky, beautifully grilled pink salmon that will become a family favorite. Five ingredients are all that you need for this outstanding dish that is impressive enough for company. In a small bowl, whisk the pesto, onions, lemon juice, and garlic. Add a few grinds of pepper and a pinch of salt. Lightly coat the grill rack with cooking oil or spray. Heat grill to medium high heat (350 F.). Once the grill reaches the proper temperature, place salmon skin side down on the grill rack. Grill covered over medium heat for about 5 minutes. Spoon some of the pesto sauce over the salmon taking care it doesn't flame up. Grill 15 minutes longer or until fish flakes easily with a fork. Baste occasionally with the remaining pesto sauce. Whatever salmon you have left over, use the next day on a salad or mix it with pasta for a delicious pasta dish. *If you're interested in our homemade pesto recipe we'll gladly post it. Can I use the oven instead of a grill? Hi, Stephanie! Yes, you may use the oven. Preheat the oven 450 F. and place the salmon skin side down on a non-stick baking sheet or non-stick pan (make sure handle is oven-proof). Prepare the salmon as we did for grilling. Bake 15-20 minutes depending on the thickness of the salmon. Finish as we did the original recipe. If you have any other questions please let us know. I cannot wait to try this deliciousness! Salmon is my favorite and well, pesto too! I always go for wild-caught and I’m glad you’re raising awareness. Hi, Kim! Pesto is a great seasoning to put on seafood. If you don’t have salmon try it on some other firm fish. Hahaha, I know the feeling! There have been so many times that I hesitated to post something cuz it’s so easy, it almost looks silly, Lol. However I am soooooo glad you posted because we eat salmon twice a week at my house, so I am always looking for a yummy (and easy please!) salmon recipe, because mine get old pretty quickly. This is perfect!! Thank you, Silvia! If you try it let me know if you like it. Hello, Khadija! Just make sure that it has skin on the one side, then you won’t have salmon on coals. 🙂 If you make it let me know how you like it. We love pesto in our house and plant basil exclusively to make pesto. I use it mostly on pasta, but yet to experiment on any other dish. We don’t eat meat or fish, but love to see what others cook, so I can learn different techniques. good info on wild salmon and farm raised ones. Hi, Sandhya! Do you make pizza or how about on flatbread or on pita? We use it on just about everything we can think of. This looks so good – salmon is such an easy, healthy dinner. I like the rundown on wild vs. farm raised – we always choose wild caught, too, but the price difference surely gives me pause when I buy it. Fish sustainability is so important, though. I love the pesto topping – a great combination of flavors. I am not big on salmon because it is a little strong for me but this recipe can be applied to many types of fish!! The pesto is amazing!! Thank you for the information on farm raised vs wild caught. I think a lot of people are confused about the two and think that farm raised is better because it is cheaper. Hi, Jennifer! Yes, indeed, pesto is delicious with any kind of grilled fish. And I would rather spend a little more on food that not only tastes good but is good for us too. This recipe looks great! We had lots of salmon this past summer, and I expect to have more soon. So, I’m on the lookout for great new ways to prepare it. This is perfect for us. Lucky you, Debi! I had a friend who moved from Montana — her boys loved to fish in the streams and they had an abundance of salmon. She even canned hers. 🙂 Let me know how you like the recipe, if you try it. Marisa, you just had me at Salmon & Pesto !! They both are my favorite and all that knowledge about Wild/Farm raised salmon is priceless. I always used to wonder why so much of a contrast but you explained so well. I also liked the fact that you used homemade pesto that means much more flavors. Would try this soon. Hi, Molly! A while back I had to go and study about the difference so I could justify the expense to hubby. 😉 A big difference is in the taste — the wild is just so much better. If you try it let me know how you like it. 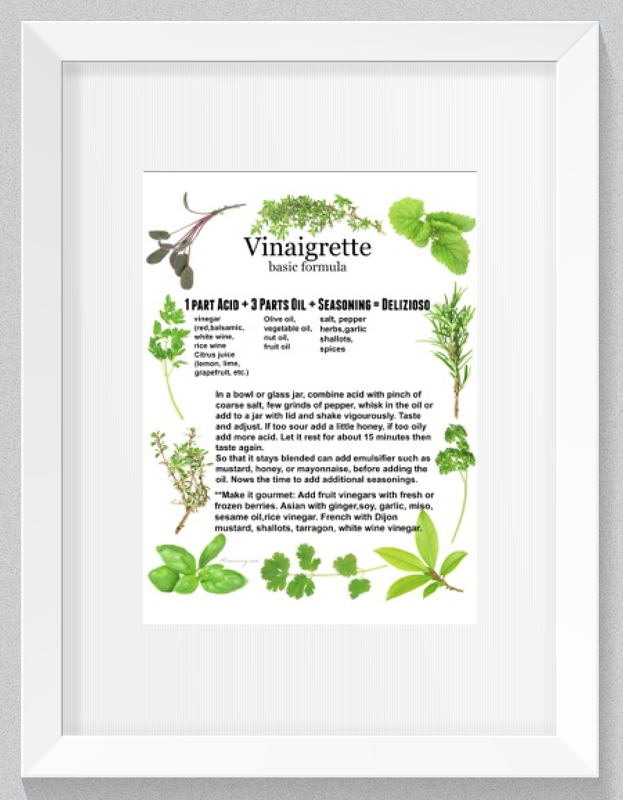 I like that you used homemade pesto which is in my do list, but my mint and basil died due to winter. May be next summer I will give a try to this dish. Pesto on salmon is very easy recipe that too under 30 minutes. Hello, Swathi! It’s funny how we get so much basil all at once and then nothing. We had to cut back our mint because it was going crazy. Now with winter – nothing. Hope you try the recipe. Pesto is so versatile! I keep learning more and more ways to use it. I bet the lemon compliments it well. Hello, Amy! 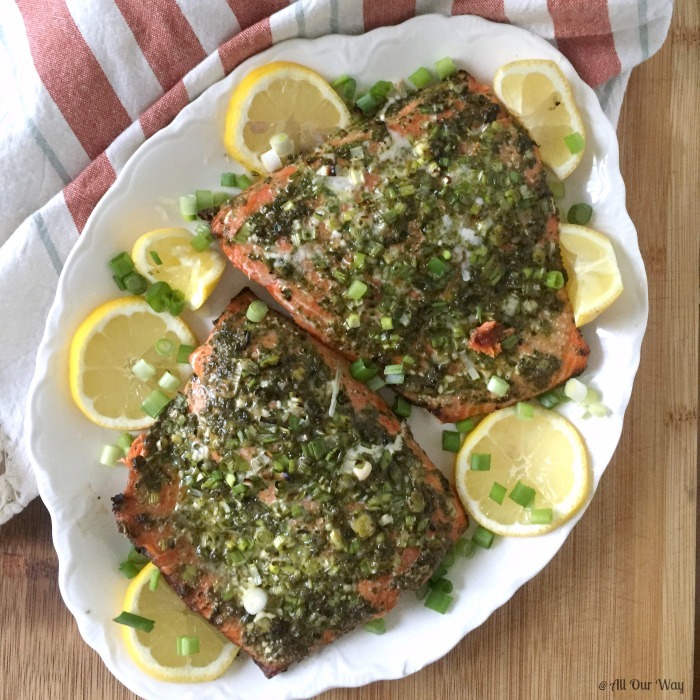 Lemon, pesto, salmon all work well together — YUM! Pesto is so versatile. We’ve used it on pizza as well as on our pasta. Hello, Jolina! The wait for grill weather will be worth it. 🙂 You’ll really enjoy it. Such a pretty dish! I wish my husband would eat salmon or pesto. He’s not a fan of either, which I suppose is “good for me, all the more for mom.” But it seems like too much trouble to make separate meals when there’s only two of us at home these days. I will be bookmarking this recipe in case he goes out of town on business and I get to cook for myself! Hi, Noel! Hubbies can be stubborn at times. Mine said he didn’t like broccoli when we were first married — he now loves broccoli. 🙂 Who knows your hubby may change his mind. Make it for yourself and dare him to take a taste. Pesto and salmon together are one of my very favorite combinations!! I’ll have to try your version soon- I have a freezer full of pesto that needs used up! Hi, Sarah! Lucky you, to have a lot of pesto! We use it like mad. 🙂 I’m sure you’ll like it on salmon. This pesto salmon looks absolutely divine! And I’m with you, we always go with wild caught salmon. Luckily, we have a grocery store that offers responsible choice seafood so it’s readily available for us! Cannot wait to get some salmon and try this recipe-STAT! Hi, Megan! Let me know how you like. I was raised on lots of grilled fish with pesto. I love it. I hope you like it too. Wow – Marisa, this salmon dish looks so wonderfully delicious! I am so new to the world of pesto flavour, because I’m not a huge fan of basil, but I do tend to like the flavours of pesto. I can just imagine how good this salmon dish tastes. YUMMY. And, by the way, I’ve been following your photography training on Instagram – bravo, your work is paying off! Thank you, Byron! The pesto works great with any grilled fish. And I am enjoying the photography training. I figured I’d better learn about my camera and photography and this is doing it. Can’t wait to make your ragú. Thank you,Stephanie! I hope you try the pesto and salmon combo it really is great. It’s also really good with other seafood. Salmon is one of our favourite seafoods. Grilling it is so delicious. I have never tried it with pesto, but hey, we love pesto. Seems like the perfect match to me. Gotta love these quick, easy and oh so delicious dinners. Hi, Gloria! Salmon and pesto make a wonderful marriage! Easy dish that looks and tastes delicious?! My kind a meal 😉 Marisa, this salmon looks absolutely amazing. I’m a huge fan of seafood. Never tried fish with pesto, so I’m pinning this to try. Thanks for the recipe. Hello, Natalie! Pesto is such a great addition to anything and salmon is always a special meal for us. Hi, Janet! It certainly is a great way to flavor fish but not overwhelm it. Let me know how you like it. Sounds like a wonderful combination! Just made salmon last night. Wish I had seen this recipe before… ! Ciao, Frank. It was my mamma who introduced me to using pesto with grilled fish. Perhaps next grilled salmon meal? Felice di trovare il vostro posto. Grazie molto e tornerò. Ciao! I’m also happy you found my post and I would be very happy if you’d return. Buon weekend. Love those shots. The salmon looks to die for. Thank you, Aish! The salmon was so creamy and moist. Hubby loves salmon and pesto! This is going on the must make list for us! I love your pictures and this recipe. I also love salmon but have never tried with pesto. This is a will do!!! Thank you! Try it with pesto — you’ll love it! Salmon is so delicious. This is a great way to prepare it. Pesto is perfect to pair with it too. Love pesto, it gives such a great flavour and what a quick and easy dish to make. Wild caught salmon is the best. Grazie, Chiara! My folks always talked how bitingly cold the Bora was! Hopefully, we’ll all get some warm weather soon. The pesto with the salmon is really the way mamma made most fish. Un abbraccio! Great info! I also prefer wild caught salmon. And I’m so glad that you posted this recipe – you can never have too many quick and easy recipes that are delicious! Loving the pesto and salmon combo! Thank you, Kathleen! I do like having delicious go-to recipes. Most of us have pesto on hand and it makes a great addition. Hope you had a great New Year! You just might make a salmon eater out of me! I’ve never been a huge fan, however, the thought of pesto as a topping is very intriguing! Thanks for sharing! You’re welcome, Annie! Try the wild caught salmon, don’t overcook, and put the pesto on it. I think I might just make you a salmon lover. Have a great day! 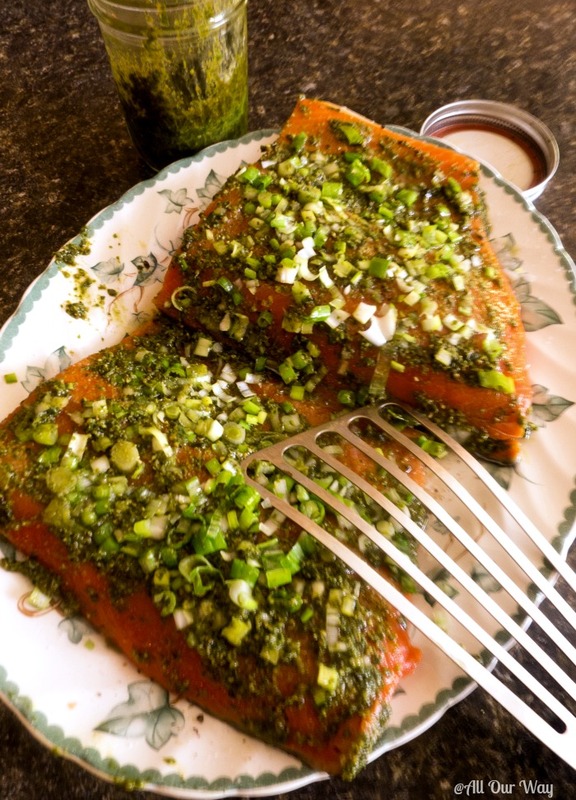 Grilled with pesto, your salmon certainly sounds terrific. Thank you, Karen. Pesto is such a great addition in a house. You can use it with so many dishes. I love salmon and this sounds delicious, can’t wait to try it. Thank you, Wendi! I think you’ll do great with this salmon. Try it — just don’t overcook it. Have a great day! Yes! 30 minutes meals are my fav!! I’ve always put pesto on chicken, but never salmon! I think Hubby will love this, he loves salmon and pesto and has never had it together. He’ll think I’m a genius. (I hope you don’t mind if I tell him I invented this deliciousness??) I may need some saving grace since I’m not using that exercise machine he got me. 🙂 haha JK! He’d know I don’t invent new recipes, lol! Have a great week! Well, Elizabeth, I’d tell hubby you thought of it because you did. You thought of it after you saw it and then you made it. Genius!! And the exercise machine? You can always say, “WHAT??? You think I’m fat???? I thought you believed I was perfect. 🙁 sniff, sniff! Ellie can show you how to get a really pathetic look. 🙂 Have a great week. I never thought to use pesto on salmon. I do like to buy wild fish whenever possible, but it always seems like the wild salmon is dried out looking when I’m in the market, compared to the farm raised, which always has a “fresher” look. 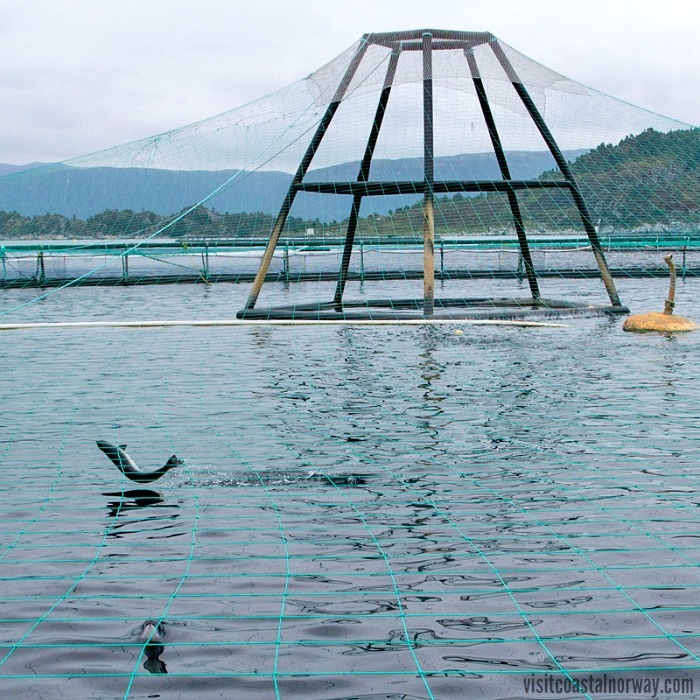 I know there are some fish farms that are reputable. I need to do more research on that. Hello, Linda. Pesto is really great tasting on the salmon. Hubby and I don’t buy salmon as much as we used to — it’s pricey but we wait for a good sale and then buy the wild caught. Let me know if you try the pesto on the salmon. Have a great week. What a great combination and it looks fabulous. I prefer wild caught also. This recipe is definitely on my grill list. Hi, Jovina! What did you do with our warm weather? We’re freezing here. It was 35 F. this morning. 🙁 I bet you have some pesto in the fridge or freezer! Am I right? If you do, you have the basic ingredients — let me know how you like the recipe. Happy Sunday! Don’t fret warm weather will return tomorrow. I always have homemade pesto on hand. You are right. Stay warm.